When you have plans and need to leave the house for an extended period, you want to make sure your cat has everything it needs. Only the best cat water fountain can ensure your beloved feline friends comfort in warmer conditions and some of them just look great in any home. Having filtered water really reduces the chances of your cat getting infections, and some filters can be very quiet. We have searched for what we believe are the best that money can buy. Each fountain has unique characteristics and can really make you feel at ease when leaving your cat alone. 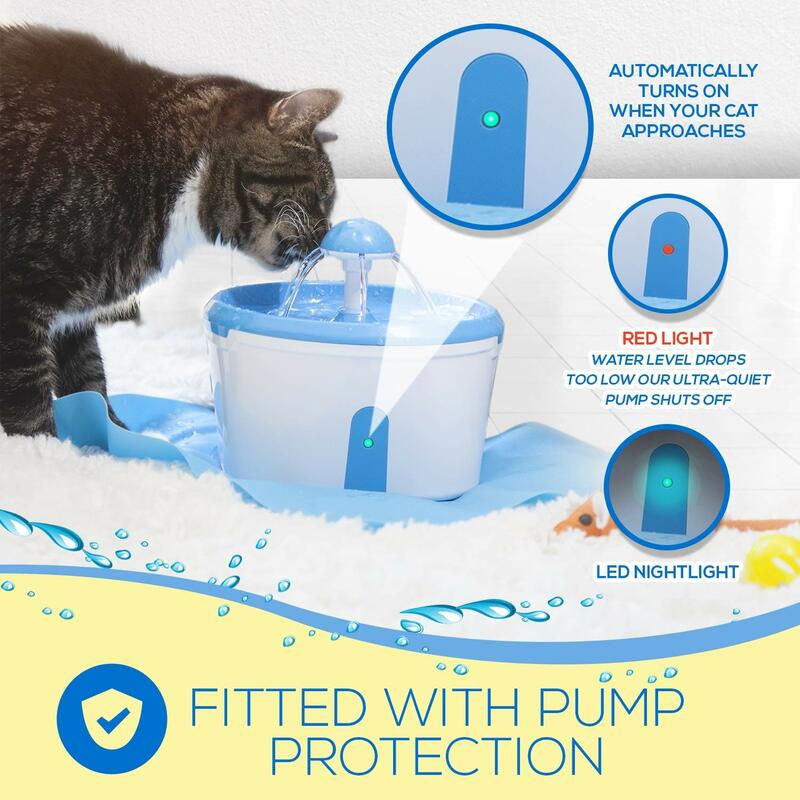 - It pushes only filtered water up to the surface where your cat drinks. 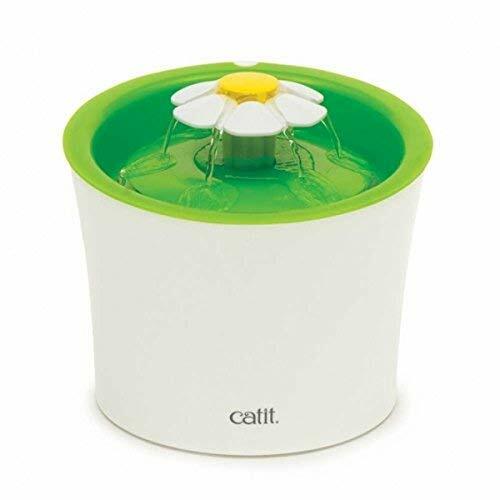 - This water fountain helps to remove calcium and magnesium. ​- It can run for 10,000 hours. - The plastic is food grade, BPA free and long lasting. 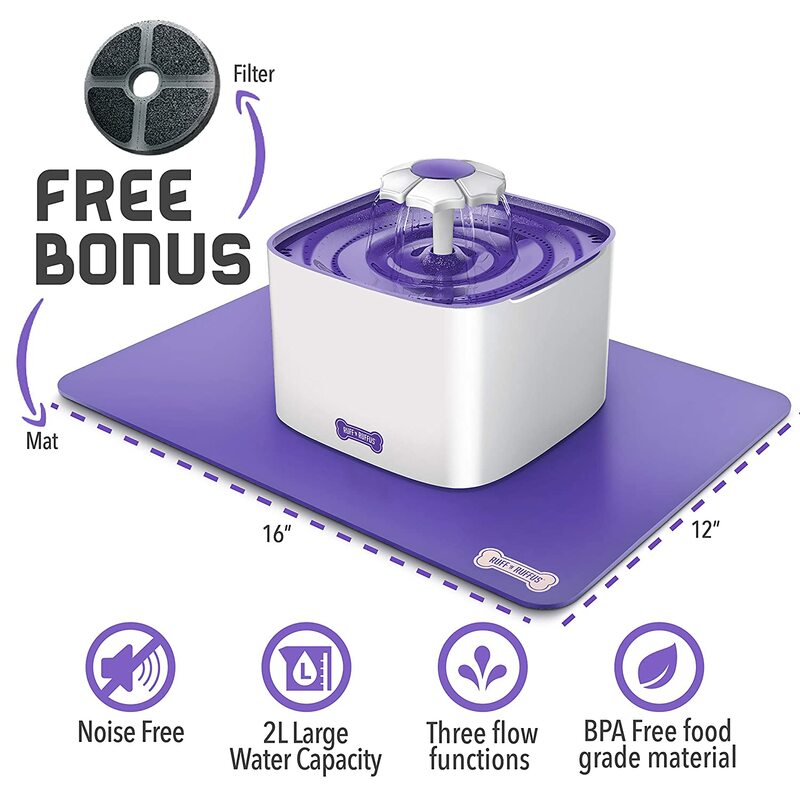 - It comes with a free slipp matt which is good if you pet is a messy drinker, as well as a free filter. - Used for both dogs and cats. This pretty little unit brings a little bit of color to your home and doesn't compromise on functionality. The company themselves have a very good reputation online and are known for making high quality products that last. Catit has a very functional website with a lot of informative advice on there. Water fountains are good for many reasons but ensuring your cat always has clean water should be near the top of everyone's list. This is exactly what you get from the Catit flower fountain. 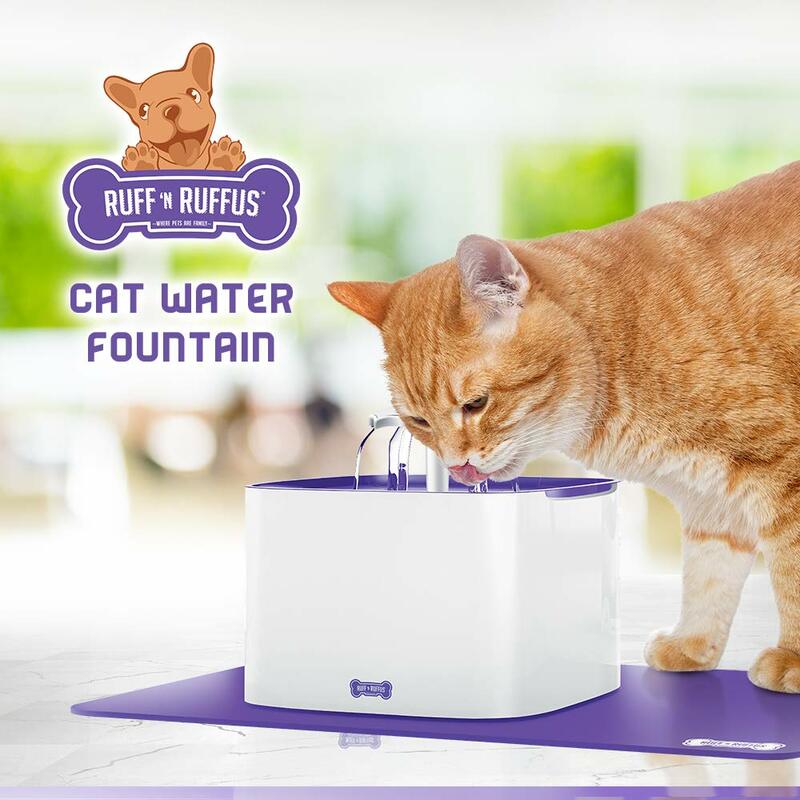 It pushes only filtered water up to the surface where your cat drinks. You never have to worry about her sipping on dirty or old water again. If you are worried about diseases, then this water fountain helps to remove calcium and magnesium. This is good because these are the type of things that can gather in your cats urinary tract and cause numerous health issues. The filter is also good for collecting stray hairs and keeping itself and your cat clean. The 3L reservoir isn't giant, but it doesn't need to be when it comes to cats. Infact, it is probably about right in terms of what you want. It is also made from cleaner plastics, being BPA free and all. What really impressed us is how economical it is. For some people, leaving a filter on for a long period of time can seem expensive. However, we are dealing with on of the best cat water fountains here - the pump really is energy efficient. Some cat owners complain that their pet doesn't drink enough water. This could be down to how the water is presented. This is why water fountains have become so popular. 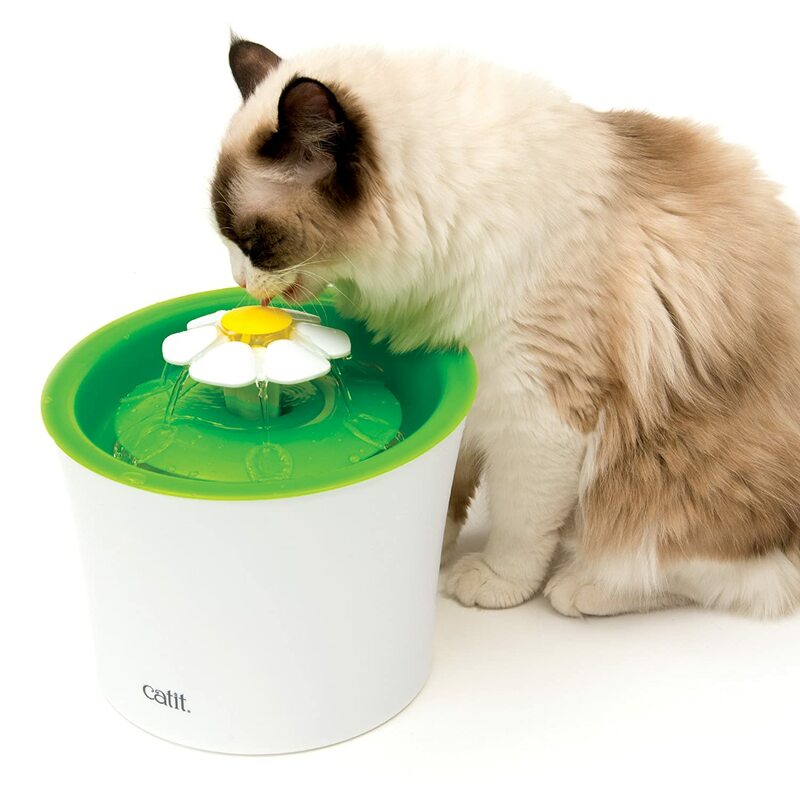 Cats love to drink from flowing sources, making this a great product for fussy drinkers. It comes with 3 different choices of flow. The gentle water flow, bubbling top and calm streams are your options. The chances are, your cat will prefer one over the other, and it is great to have the options. 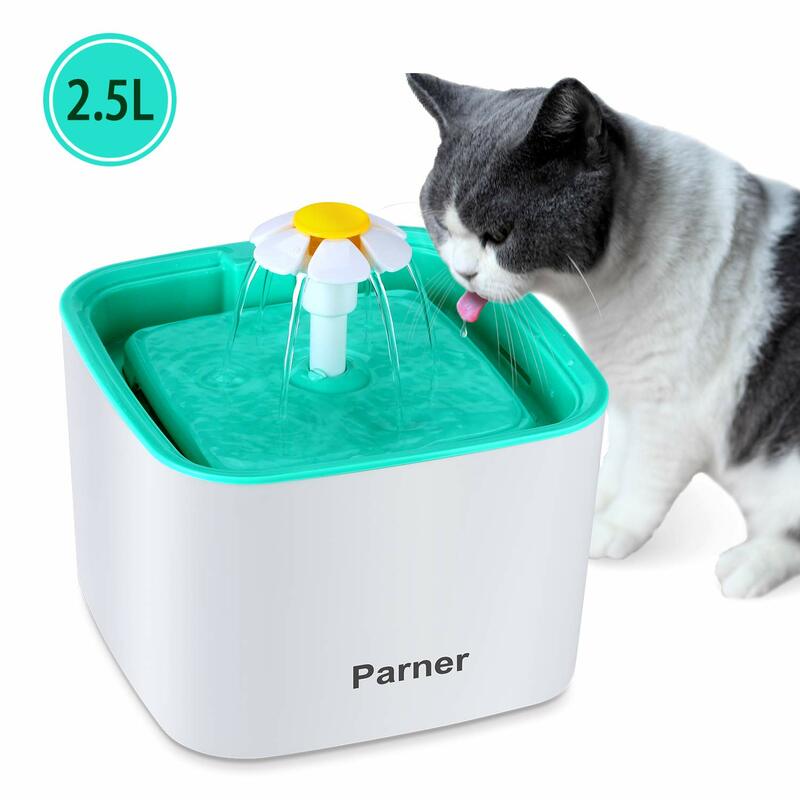 This neat looking cat water fountain is from the people at Parner, and what a good looking one it is. We like the cube type shape here and think it would blend in well to almost any home. Parner as a company are another reliable option. They are FDA approved and this product is also BPA free. 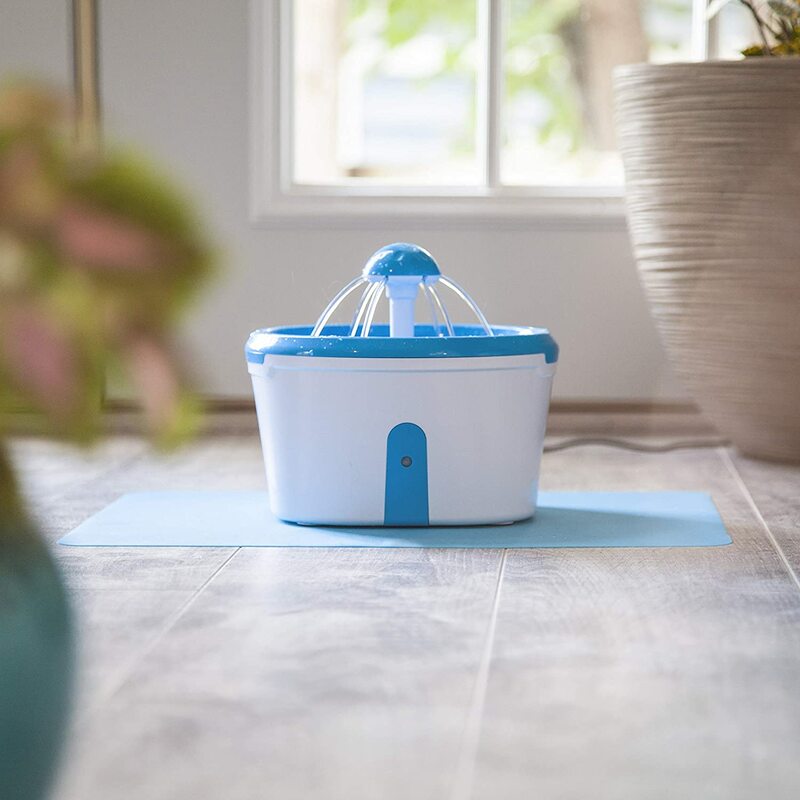 The 2.5L Capacity allows your pet to have access to clean water for extended periods of time. One of the stand out elements to this product is the fact that it is super quiet. Even if it is constantly running in your home, it won’t be distracting. Again, it comes with 3 different types of flow including gentle, bubbly and quiet mode. The 2W power consumption is also very low making it super efficient. Parner say it can run for 10,000 hours. It is easy to take apart and clean. Again, it is another excellent choice for anyone who wants to guarantee their cat clean, flowing water. With a 30 day money back guarantee, purchasing is risk free - as it should be! The advice is to clean it every couple of weeks at the latest. It is very stable and your cat would not be able to knock it over at any point. Here we have another high quality option from the people at Ruff N’ Ruffus. 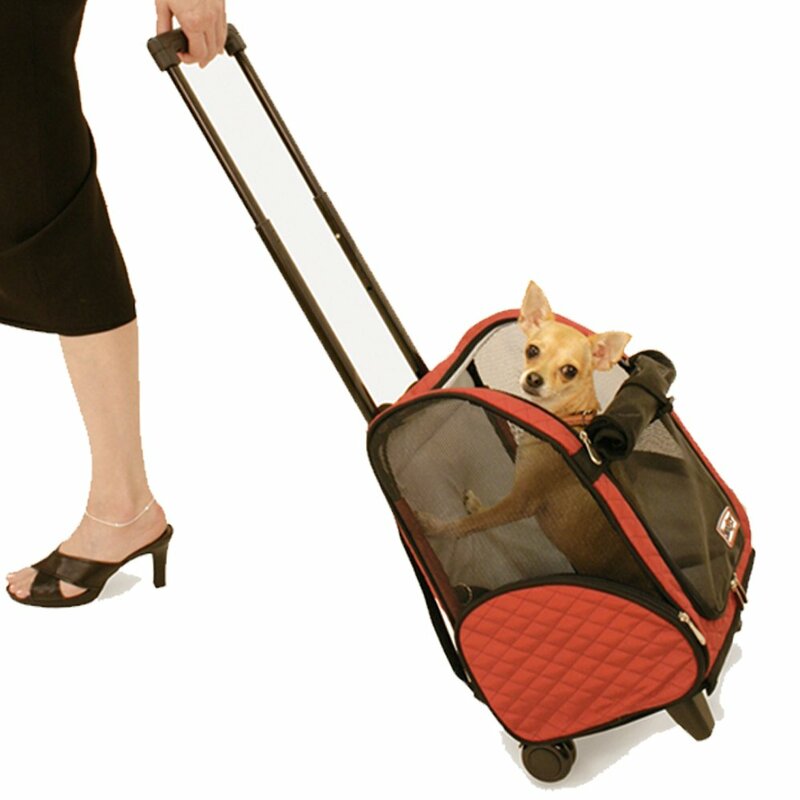 They make a wide range of products including a portable pet playpen to hip and joint dog chews. 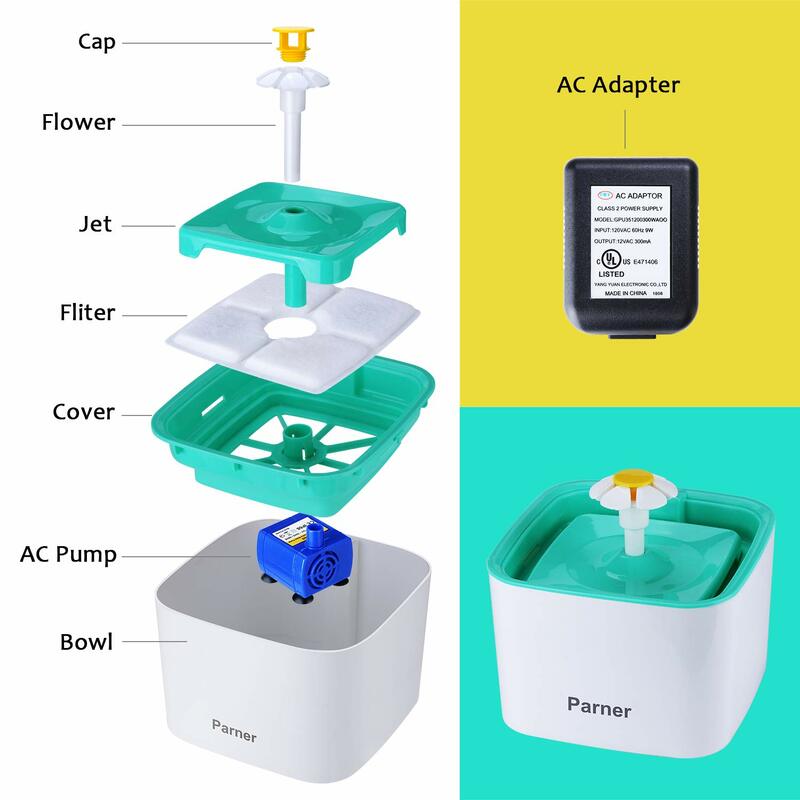 With bark control collars and other gadgets available, their cat water fountain is a serious contender in the world of pet care. We mentioned that it is high quality, and this evident in the materials used. The plastic is food grade, BPA free and long lasting. Not to mention, it is a very strong piece of equipment. 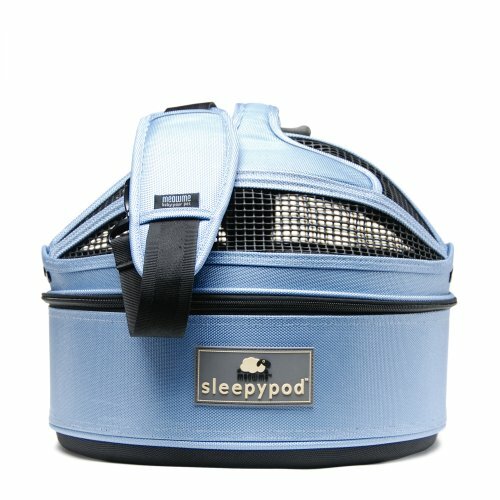 If you like to get a bit extra when purchasing pet care equipment, then you won't be disappointed here. It comes with a free slipp matt which is good if you pet is a messy drinker, as well as a free filter. If a quiet cat filter is what you are after then there is virtually no noise when using it. There is a 2L capacity which isn't as high as the previous two products, but is still plenty enough for what you will need it for. 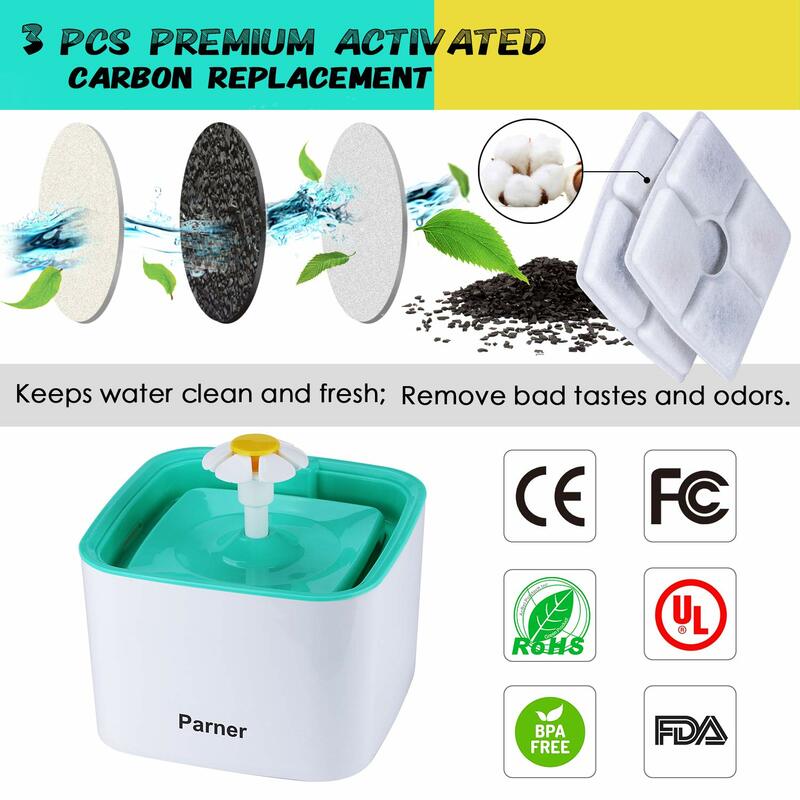 There is a charcoal filter and a filtration system that removes bacteria, making the water your cat will be drinking, safe and really clean. We like that it is easy to assemble and won't take long to set up. Again, it is a very efficient in terms of energy and won't make a big difference to energy bills. A great option that won’t look out of place in your home. Our final product today, but have we saved the best cat water fountain for last? Made by Homebound, another market leader in the world of Pet products. We like that they seem to really know what they are doing and use high quality materials. The charcoal activated filter really works to get rid of any nasties in the water, making it incredibly clean. 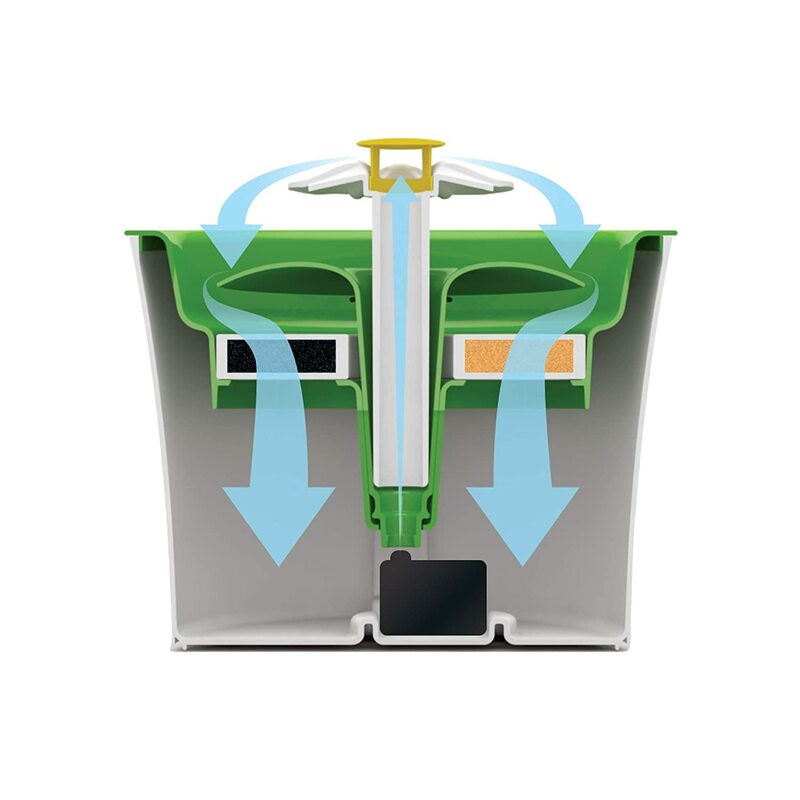 The broad base also ensures that it cannot tip over - something that low quality water fountains can be guilty of. 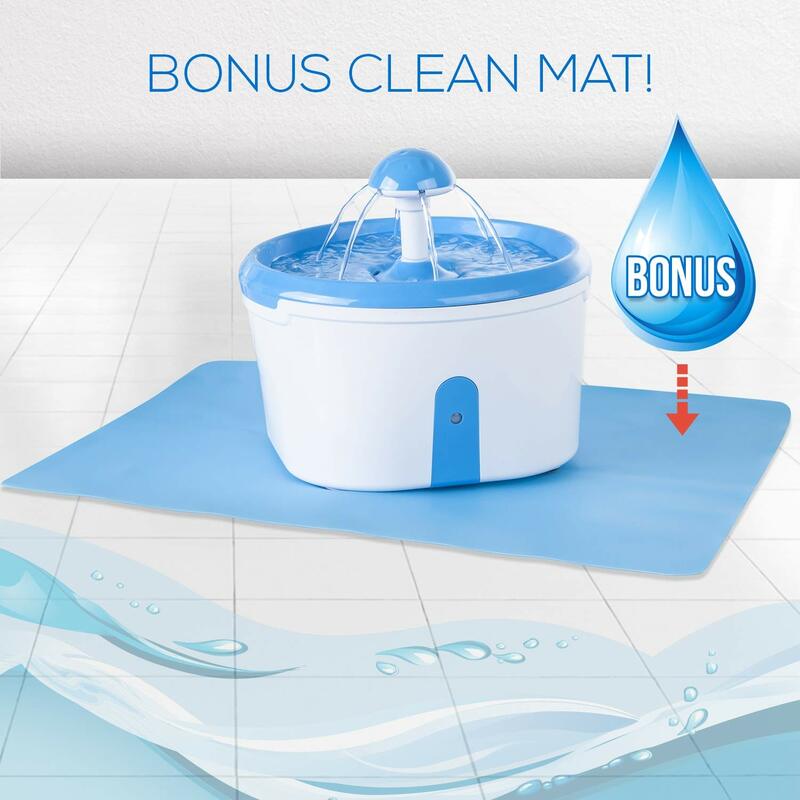 It also includes a mat that stops it from slipping and keeps the surrounding area clean. What makes this option a little different is the red light that comes on when water is low. The pump actually switches off if water levels are too low. 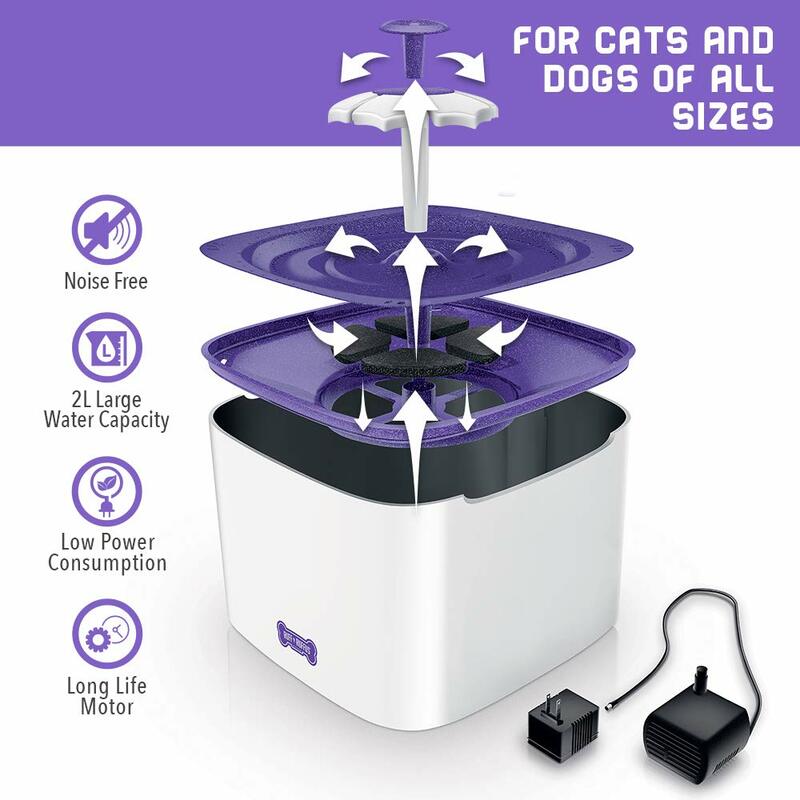 There is a 2.2L reservoir, more than enough to cope with your cats demands. 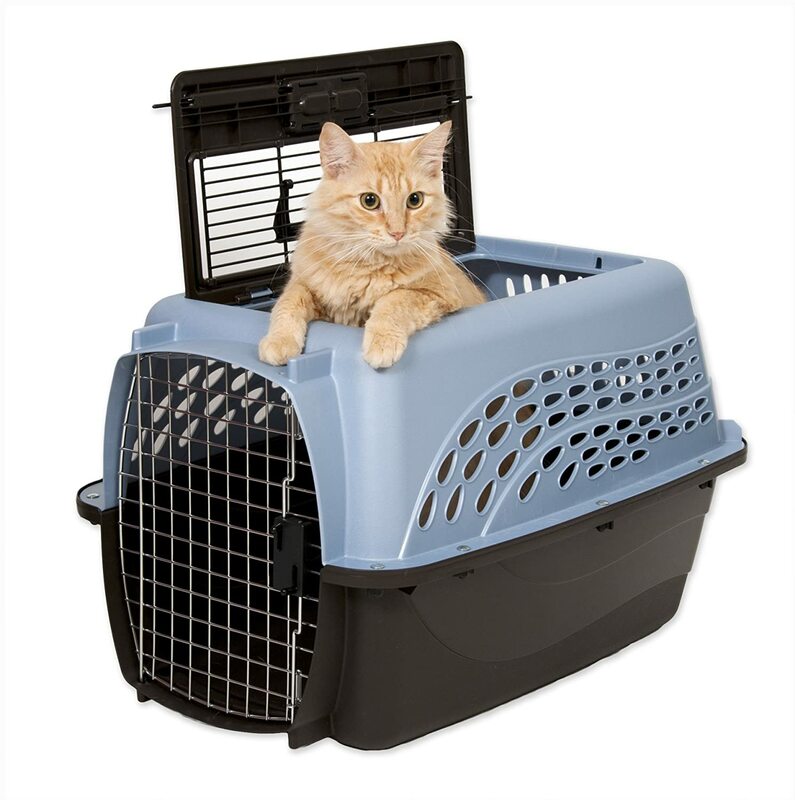 Worries that your cat won't be able to find it as easily in the dark? The LED nightlight makes it as easy as possible for your cat to get what it needs. There is also a money back guarantee when purchasing, once again, this is something we recommend. It only switches on when your cat moves towards it, again it is super energy efficient. As you would expect it is also very quiet and you can purchase 10 packs of filters that will last a long time. Every single one of our options above will make an excellent choice. However, only one had a couple of extra attributes that made it stand out. We like that the Homebound Cat Water Fountain also came with an LED nightlight as well as the capability to switch off when not in use. It ticks all the important boxes such as being very quiet, having different flow options and being made from high quality materials, but it also went that step further. Remember to introduce your cat to it gradually, don't try and force it upon them straight away as this can make it take longer to adapt. Before too long, your cat will be enjoying fresh and super clean water from one of these cat water fountains.